FACT CHECK: Peer-Reviewed Study Proves All Recent Global Warming Fabricated by Climatologists? A blog post, even if you like it and it is presented in downloadable PDF form, is not a peer-reviewed study. A peer-reviewed study has found evidence that nearly all of global warming has been fabricated by climate scientists. 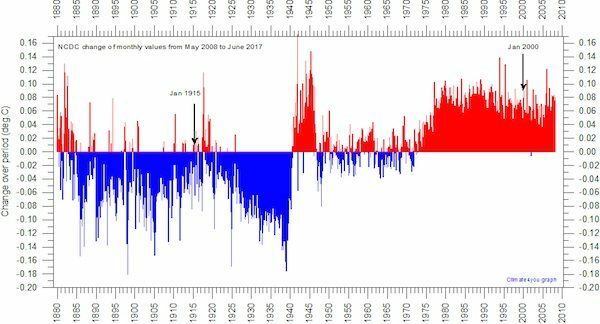 The peer-reviewed study by two scientists and a veteran statistician looked at the global average temperature datasets (GAST) which are used by climate alarmists to argue that recent years have been “the hottest evah” and that the warming of the last 120 years has been dramatic and unprecedented. What they found is that these readings are “totally inconsistent with published and credible U.S. and other temperature data.” That is, the adjusted data used by alarmist organizations like NASA, NOAA, and the UK Met Office differs so markedly from the original raw data that it cannot be trusted. Breitbart here lowers the bar for what passes as both “peer-reviewed” and a “study”. This report, published on a WordPress blog run by co-author Joseph D’Aleo — a meteorologist who did not complete a PhD, but who prominently advertises his honorary doctorate on the document’s cover page — is not published in a scientific journal. Additionally, this study is not (as implied by some coverage) an official publication of the Cato Institute, despite the fact that co-author Craig Idso is an adjunct scientist there. “This study was not published by the Cato Institute,” a representative of the libertarian think tank told us. The claim of peer review, widely reported by numerous outlets, evidently stems from the second page of the report, in which the names of seven scientists (spanning a wide range of fields including aerospace engineering and economics, despite a complete lack of discussion of these topics in the report) appear under the banner “The Undersigned Agree with the Conclusions of this Report”. Reading a study and saying that you agree with its conclusions is not how peer review works. 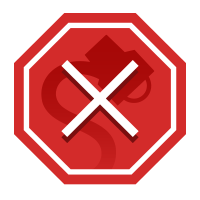 A formal peer-review is a structured process that by nature requires a third party, usually a journal editor, who oversees an iterative process of critiques and revisions. I provided critical comments to the lead author. We then discussed them and appropriate changes were made to the report. The main argument of the Breitbart article via this “study” appears to be that if you look at global surface temperature records compiled by a variety of governmental organizations, corrections applied to this data since the 1980s have steadily biased the results toward making current warming appear more dramatic by depressing past temperatures and inflating recent temperatures. This chart shows the difference in the corrected global temperature values, by month, from a National Climatic Data Center (NCDC) record produced in May 2008 compared to one produced with later corrections in June 2017. Importantly, they do not show a comparison between raw data and corrected data. Note how most of the downward adjustments take place in the early twentieth century and most of the upward take place in the late twentieth century. According to meteorologist Joe D’Aleo, who co-authored the study with statistician James Wallace and Cato Institute climate scientist Craig Idso, this has the effect of exaggerating the warming trend. “Nearly all of the warming they are now showing are in the adjustments,” [D’Aleo said]. This statement implores us to falsely interpret the figure as showing changes to the raw data itself. As previously mentioned, however, this chart (and many similar ones in the “study”) shows changes between two versions of corrected data. To make the point Delingpole thinks D’Aleo is making, you would need to show that corrected records of climate relative to raw data make recent temperatures warmer than the raw data, and older records cooler. Delingpole and D’Aleo’s argument, if it accurately represented the data it claimed to be analyzing, might sound reasonable in the absence of literally any other information, but sprinkle just a pinch of context onto it and the interpretation becomes increasingly unpalatable, even with those grains of salt with which Delingpole implores us to take climate science. To dive into that context, some background is needed. A bit about these records and how they are generated: Maintained by the National Oceanic and Atmospheric Administration’s NCDC and other governmental organizations, these historical records come from myriad disparate, often non-standardized, and difficult to interpret bits of information — things like ship logs, buoy data, and instrument readings from mercury and digital thermometers. Both historical and modern data are continually added to these databases. This heterogeneity of sources means there are a number of elements that, indeed, need to be adjusted if the record is to be internally consistent. One example comes from gradual changes made to the way in which temperature readings have been made since the 1950s, shifting from an evening reading to a morning reading, consequently shifting the raw data to become gradually cooler as morning temperature readings became more common. Another very significant set of corrections that needs to be made stems from multiple shifts in how sea temperatures (which are used to calculate ocean surface air temperatures) have been measured on ships. Prior to the 1940s, buckets were thrown off the side of a boat, pulled up, and measured on the spot with a thermometer. Later, people began to use the intake water temperature in ship’s engine rooms. Now, freestanding buoys are typically used, which provide relatively colder readings compared to engine room readings. Documenting the direction of these changes to the corrections, without explaining them, makes up a bulk of the main argument of the “study”. This section, which painstakingly reveals publicly available and well-discussed adjustments to historical climate records reads like a thriller, with the authors taking the reader chronologically step by step, through each mysterious (but also completely documented) correction to these global datasets. We have dramatically improved our ability to measure the Earth’s climate the last thirty years. And we’ve also launched a lot of efforts to collect all of the global temperature data. […] Scientists in the eighties and nineties undertook some pretty big efforts to go around and collect all the weather records from all the stations you can find in various parts of the world. And those sort of efforts have continued up through today. And so, when you look at their, for example, 1980 value from NASA, what that actually came from was about five hundred or so stations on land almost entirely in the northern hemisphere. That’s the best they had at the time so they said this is the best we can do for estimating global temperatures as these are all the stations that we have access to. Nowadays we actually have an ocean temperature record back to 1850 or so based on data from ships and more recently from buoys. And you know, two-thirds of the earth is ocean, so if you leave oceans out you’re gonna get a fairly incorrect answer. Clearly the historical GAST data adjustments that have been made have been dramatic and invariably have been favorable to Climate Alarmists’ views regarding Global Warming. 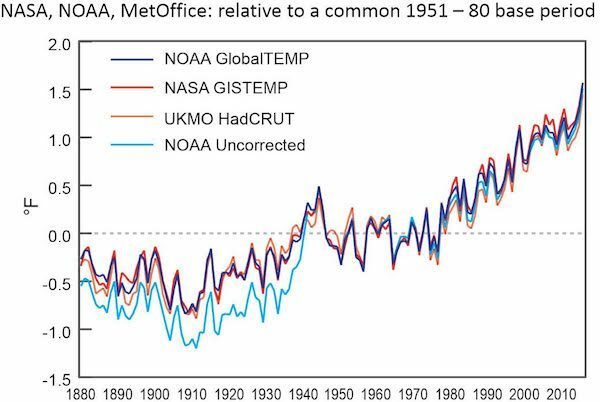 The question now is whether the latest versions of GAST data by NOAA, NASA and Hadley are credible for policy analysis, or even climate modeling, purposes. Ignoring, once again, that adjustments to these records — relative to the raw data — decrease apparent warming across the 20th and 21st century, it is also worth noting that Berkeley Earth has painstakingly reviewed this process with their own independent methodology, concluding that the records produced by NCDC and others accurately represent global temperature trends. Hausfather was the lead author on that 2017 study. Thus, it seems that beyond any doubt, the U.S. data reflected in the Global Average Surface Temperature data calculation should contain the cyclical patterns shown above. The [1980 NASA record is] only based on about five hundred stations almost entirely from the Northern Hemisphere, you do see a bit more warmth in the ’30’s and ’40’s. Again [this is] because you’re only looking at Northern Hemisphere lands. But when you add in the oceans, when you add in the Southern Hemisphere, that sort of mid-century warmth doesn’t completely go away, but it becomes much smaller. Ultimately, the central argument of this study and its representation by Breitbart and others is one based on a willful misreading of data propelled by a study whose academic rigor has been misrepresented. As such, we rank the claim that climate scientists have created global warming entirely through corrections to raw data as false. While these corrections to raw historical data have shifted over time, the cumulative effect of all corrections applied to the raw data has been to reduce apparent global warming over the industrialized period, not the other way around. and Hadley CRU Global Average Surface Temperature Data & The Validity of EPA’s CO2 Endangerment Finding”. Tropical Hot Spot Research. June 2017. Natural News. 6 July 2017. The Daily Caller. 5 July 2017. Bulletin of the American Meteorological Society. July 2009. WIREs Climate Change. July 2009. Sample, Ian, et al. “Can a Group of Scientists in California End the War on Climate Change?”. The Guardian. 27 February 2011. Hausfather, Zeke, et al. “Assessing Recent Warming Using Instrumentally Homogeneous Sea Surface Temperature Records. Science Advances. 4 January 2017.